Rumors have been rolling about since the 27-ton (59,500 lb.) black granite sarcophagus was uncovered three weeks ago in Alexandria, Egypt. One of the more interesting suggestions was that the massive stone sarcophagus was the final resting place of Alexander the Great. But there were also warnings against opening the tomb due to worries of a mummy’s curse. Despite the concerns by some, the impressive sarcophagus has been opened, and as Mostafa Waziri, secretary-general of the Supreme Council of Antiquities, said, “We've opened it and, thank God, the world has not fallen into darkness. I was the first to put my whole head inside the sarcophagus... and here I stand before you ... I am fine." 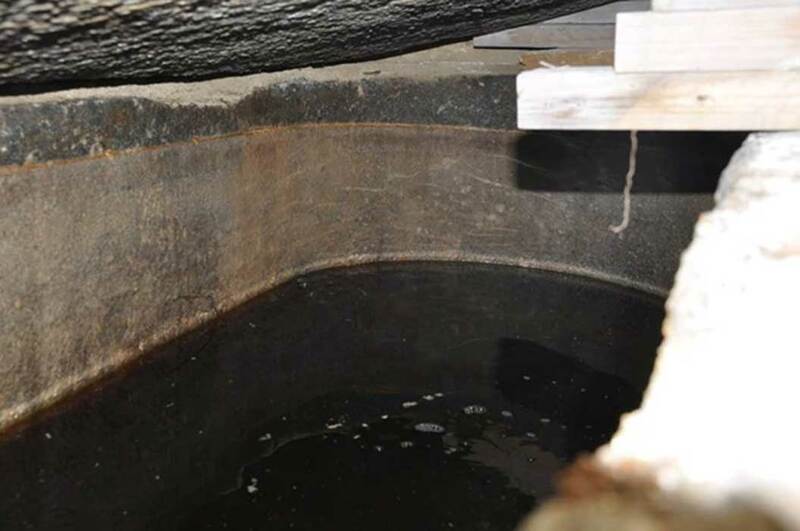 It probably took some effort to be that close to the open tomb, as BBC News reports the stench that leaked out upon opening the lid by just 5cm (2 inches) was enough to clear the site. Egyptian military engineers were called in to help pry the sarcophagus open and see what lay inside. Waziri described the contents : “We found the bones of three people, in what looks like a family burial... Unfortunately, the mummies inside were not in the best condition and only the bones remain.” Well, the bones and some stinking red-brown sewage water. The mummies were probably decomposed by that sewage water, which had seeped into the stone coffin, leaving only the skeletons behind. The officials say that their initial examination of the bodies suggests they were probably soldiers from the early Ptolemaic period. One of the skulls shows cracks from a possible arrow injury. The tomb was unearthed by archaeologists present at the beginning of a construction project in Alexandria's Sidi Gaber neighborhood. This is a common practice before any building can commence in the area and occasionally sarcophagi have been found, though they have often been looted before the archaeologists have had a chance to study them. In this case, they made an unparalleled discovery - a black granite coffin which stands at approximately 6 feet (1.83 meters) tall and over 5. 5 feet (1.65 meters) wide. Waziri said it may be the largest ever found in Alexandria. No inscriptions, art, or grave goods were found on or in the sarcophagus alongside the skeletons after the coffin was opened, but it is unclear if anything had been buried inside and decomposed. The officials say the mortar shows the sarcophagus had not been opened before they chose to do so, so at least looting seems unlikely. 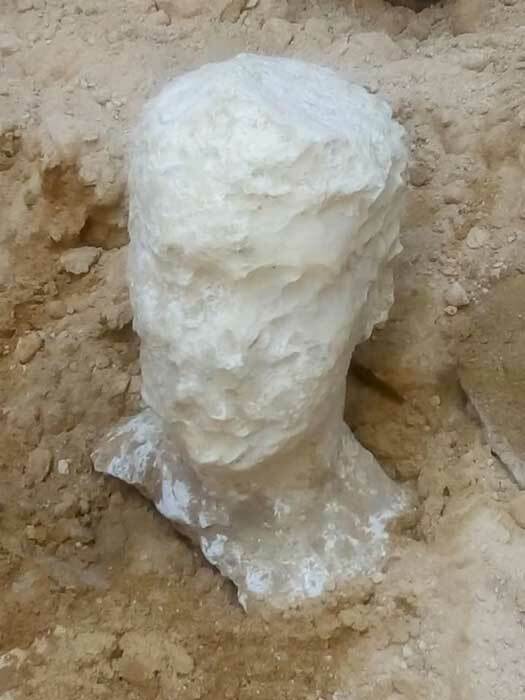 Nonetheless, an alabaster bust was found at the grave site when it was first uncovered. The bust has deteriorated and the features of the face cannot be made out; springing hope for a time that it showed a Macedonian or a Greek male of high social status (i.e. perhaps Alexander the Great). The opening of the black granite sarcophagus may have solved a couple of mysteries, but it has also led to many new questions, such as: Who were the three people? How did they die? Why were they placed in such an elaborate and massive coffin? Had they been buried with any grave goods? What can the alabaster bust say about the grave and was it a depiction of one of the deceased? If so, why were the other two people buried alongside that person? There is hope that at least some of these questions will be answered by continuing analysis of the skeletons, which are now on their way to the National Museum of Alexandria, and the sarcophagus, which will follow after it has been repaired and prepared for transport. Let them drink the liquid.